Canadian company, Micro Precision Parts Manufacturing (MPPM) had never seen a job like the one 12 others had already rejected as “impossible”; to create a surgical aneurysm clip, no bigger than a match head, in silicon nitride ceramic, which is one of the hardest materials on Earth. 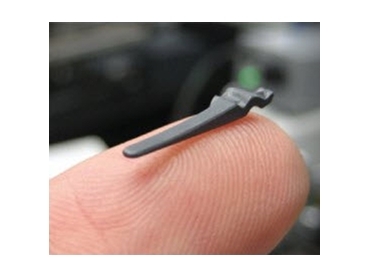 Producing this clip would require 1 million toolpath moves across an area measuring less than 12.7mm. The company’s experience with this job points out the need to have CAD/CAM and CNC capability at high resolution - plus the commitment to pull it all together. MPPM had a firm resolution to devise a viable method for producing the difficult part to tolerances within 20 microns. Little did owner Steve Cotton know that his efforts to develop that method would lead to a deeper understanding of resolution in a different sense. That is, how the resolution capabilities of all tools involved in the process, from the CAD model to the output of the CAM system and CNC, affect the boundaries of his machine tools’ capacity for precision. MPPM attempted to machine prototypes of this new style of surgical aneurysm clip, designed by Concept Solutions of Vancouver, and said by Dr. Garnette Sutherland, M.D. of the University of Calgary, to be a device that could potentially advance neurosurgery by 30 years if approved. Concept Solutions found MPPM online, noting that certified Rolex technicians, like Cotton himself, offer a certain calibre of finesse that they likely expected to cross over into his machining work. MPPM’s equipment included a mill and lathe from Sherline, an OL-1 office lathe from Haas and two Haas OM-2A office mills, each equipped with laser tool presetters from Renishaw. The programming was done using the Mastercam CAM system from CNC Software. The input that brought the whole process together was from In-House Solutions, the company’s British Columbia-based Mastercam vendor. The challenge with the new clip is the material from which it’s constructed: silicon nitride ceramic. Like titanium, this substance is readily accepted by the body, however unlike titanium, it is virtually invisible during MRIs and CT scans, allowing a full view of the aneurysm itself. To view this entire lead story from the September issue of Australian Manufacturing Technology please visit AMTIL 's Ferret listing and follow the links from there.